Check our online availability calendar to view our most current rates for both low and high seasons, along with any special offers or discounts. Click the availability calendar and you'll see an easy-to-read date range. Lakeside Suite is $140 plus tax. Resurrection Peak and Mt. Tiehacker Rooms are $120 plus tax. Room rates are based on double occupancy. There is a $25 charge for each additional person. There is no charge for children 2 or younger. Please call for bookings or inquiries more than 1 year in advance. As a small property, Bear Lake Lodgings pays a commission rate of 15% to the online travel booking sites! We have a secure reservation system in place, and booking direct helps us keep our rates lower. Please consider booking direct from our reservation system. It's easy! Check the calendar above, or click here, to see availability and to any last-minute specials! Check-in: 4:00 - 8:00 p.m.
Special arrangements are possible; please call ahead. Anchorage Accommodation! 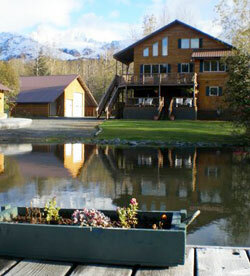 Book the Anchorage Oasis vacation rental for your next trip to Anchorage. The Anchorage Oasis is not able to be booked online. Please call to check availability or make a reservation. Bear Lake Lodgings Bed & Breakfast is located approximately 3 miles outside of the town of Seward. It's about 4½ miles to the Small Boat Harbor, 6½ to the Sea Life Center, and 3 miles to Exit Glacier (Herman Leirer) Road. To get here, turn off of the Seward Highway onto Bear Lake Road and follow the road for one mile. When you come to the end of the pavement, turn left into the driveway. You're here! Reservations require a 25% credit card deposit. We accept Visa and MasterCard. Full payment is due upon arrival. We gladly accept cash, check, or credit card for the remaining balance. Any more than two guests per room shall be subject to a charge of $25.00 per person per day. No charge for children 2 and under in Lakeside Suite only. Children under 7 years are allowed only in the Lakeside Suite. Only children 7 and over are allowed in the Mt. Tiehacker Room, Resurrection Peak Room and Bear Lake Deck Suite. As a small lodge, cancellations have a large impact on us. If you cancel your reservation 30 days or more prior to the scheduled arrival date, a $25 Administrative Fee will apply. Cancellations or changes within 30 days prior to arrival are subject to a 50% penalty or the cost of one night stay, whichever is greater, unless we are able to re-book. Cancellations or changes within 7 days prior to arrival are subject to the entire cost of the reservation minus any part that we are able to re-book. We will make every attempt to re-book. Well-behaved children are welcome in the rooms as noted above. Room prices include maid service. However, tips are always appreciated. In Alaskan tradition, we ask that guests remove their shoes when inside the B&B. The lodge is smoke-free, and we regret that we cannot accommodate pets. We also regret that we cannot allow guests to cook in the kitchen or in rooms, and we ask that guests keep all food in the dining room. We reserve the right to cancel any reservation for any reason at any time.